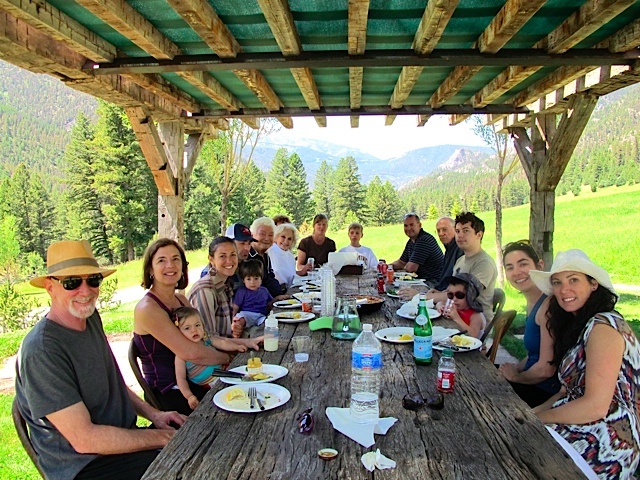 This summer our family invaded Montana. My married adult children + their kids + Wayne and me = nine. NINE bodies. Plus four car seats, countless pieces of luggage, booster seats, iPads, travel pillows, car food, the list goes on. We rented a highly unattractive 15-passenger white van and, once we were sure that everyone was on board, set off for our long-planned family reunion near Yellowstone National Park. We made several bathroom breaks and food stops and overnighted in Coeur d’Alene Idaho at a motel with a swimming pool. So you might be wondering, “How was it driving nine hours for two consecutive days with four kids under the age of three? ?” Ninety percent of the time it was fine (loud, but fine). The other ten percent of the time … it was bad. Really bad! Let’s just say we won’t drive that far with that many children in tow again anytime soon. His culinary skills are legendary and we feasted on fabulous dishes including paella, wood fired pizzas (including a dessert pizza topped with fresh ricotta and raspberries) wild boar and chicken chili, and a 4th of July buffet including smoked, dry rubbed ribs and chicken. He allowed me in the kitchen as a guest sous chef and asked for my help with meat prep. I stuffed whole chickens, placing fresh herbs between the skin and the meat, removed the silvery membranes from the meaty ribs and pounded a pile of chicken breasts, rolling them in parchment paper for a luncheon feast. I loved helping, yet I am usually the one giving orders in the kitchen and found the role of sous chef a little less fun. My favorite lunch, which we ate on a grassy knoll at a rough hewn rectangular table, consisted of chicken paillards and a simple arugula salad. Clean, simple food that even the young kids scarfed up before running off to play in the yard. I mentioned the pounding of the chicken breasts, and I did eighteen of these babies. I always find that using a meat pounder – wood or metal – is a great outlet for any angst or pent up frustration. 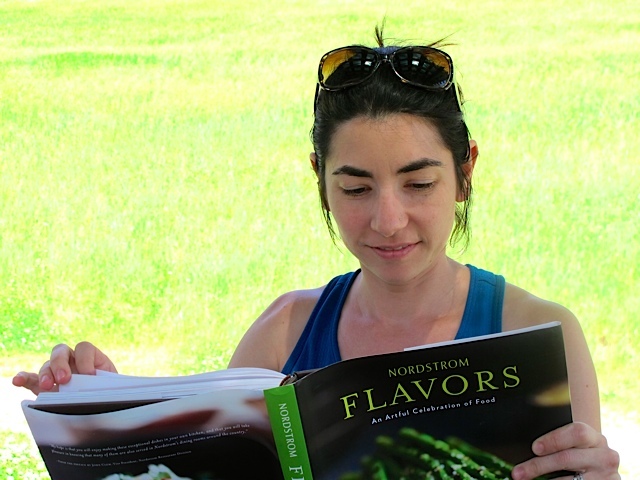 I inquired about the recipe and was told that it was originally published in Nordstrom Flavors by Michael Northern. I ended up ordering this cookbook to add to my collection–and I’ve earmarked several other recipes I plan to try. Keep watching for my twists on some new recipes! Below is my interpretation of Chicken Paillards (pronounced Pay- yar’) with salad – with many changes from the original printed recipe, of course. It’s a great, do-ahead, light summer dinner or luncheon dish that will appeal to most everybody. Cut parchment into 12-15 inch squares. After removing the tenderloin portion of the chicken breast, place the remaining chicken in a zip lock plastic bag. Pound the meat until it is approximately 1/4 inch thick – this takes some muscle! Remove the breast from the bag, place it on the square of parchment and generously brush the top with olive oil and sprinkle with salt and pepper. Turn the breast to the other side and brush and season the same way. 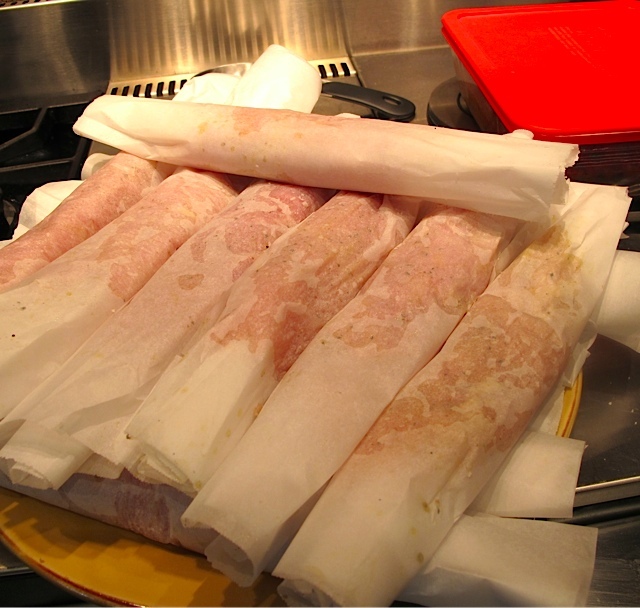 Roll the breast with the parchment on the bottom and make a “log” Repeat with the other chicken breast halves using the same plastic zip lock and put the “logs” of parchment-wrapped chicken onto a plate and refrigerate up to 8 hours before continuing. In a large sauté pan, heat two tablespoons of olive oil until hot but not smoking. Unroll the breast and lay flat into the fry pan–my pan is large and I could do two breast halves at a time. Sauté for about a minute, turn with tongs to the other side and continuing cooking another minute until slightly brown. If you are doing a multitude of these, you can keep them warm on cookie sheets in a 250 degree oven briefly until you are finished sauteeing and ready to serve. Add all ingredients except oil to a blender and whirl until well combined and smooth. Slowly add the olive oil to emulsify. Set aside. You will have a lot of this left over, and it keeps in the refrigerator for a month. It pairs well with Greek type or chopped vegetable salads). Put all salad ingredients in a large salad bowl. Right before serving, drizzle with about ½ cup of dressing and gently coat the salad. To serve: place about ¼ of the dressed salad on the side of each dinner plate and top with the cooked chicken. Put two lemon wedges alongside and encourage your guests to squeeze the juice onto the chicken before consuming. Bon gusto!! 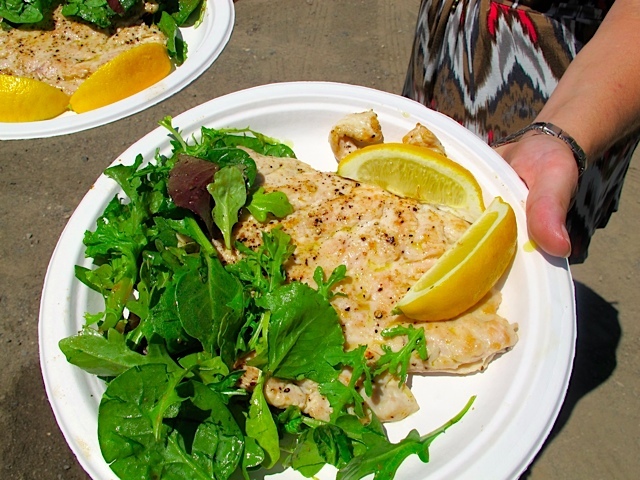 This entry was posted in Meat, North America, uncategorized and tagged Chicken Paillard. Bookmark the permalink. The recipe sounds great, but OH-MY, that place, that view, that table. Lucky you! Your brother-in-law sounds like he was made to be part of the family!